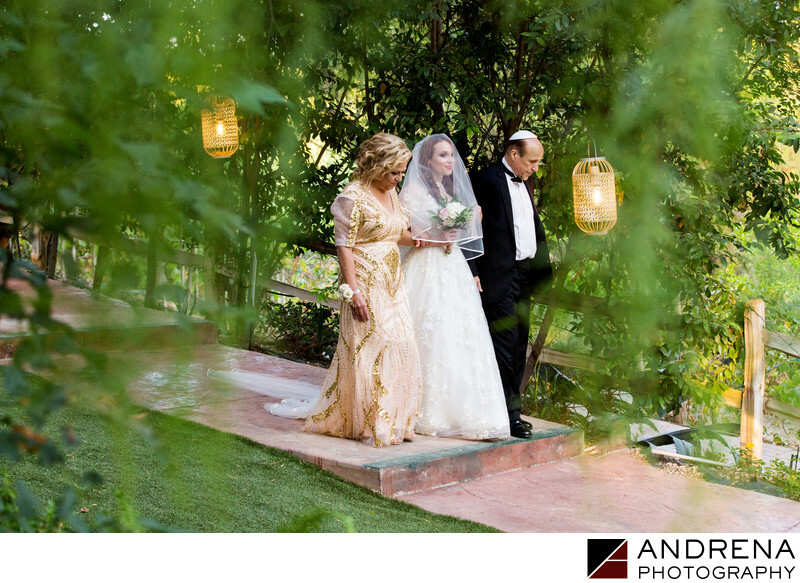 Jewish weddings are so full of love and laughter, and this wedding at The Vineyards in Simi Valley near Los Angeles was no exception, giving my team a wonderful opportunity to create beautiful ceremony photos. For this image, I was perched under an elevated chuppah, which gave me a high vantage point. As the bride walked down the path with her parents towards the ceremony to marry her groom, I noticed a space between the dripping leaves of a weeping willow tree. I timed this photo perfectly, as the greenery framed the bride and her parents beautifully. It isn't often that a ceremony processional is framed by trees but when it is, it is always beautiful. Location: The Vineyards, Simi Valley, California. Keywords: Ceremony (6), jewish wedding (6), Photography (9), Vineyard (3), Weddings (6).